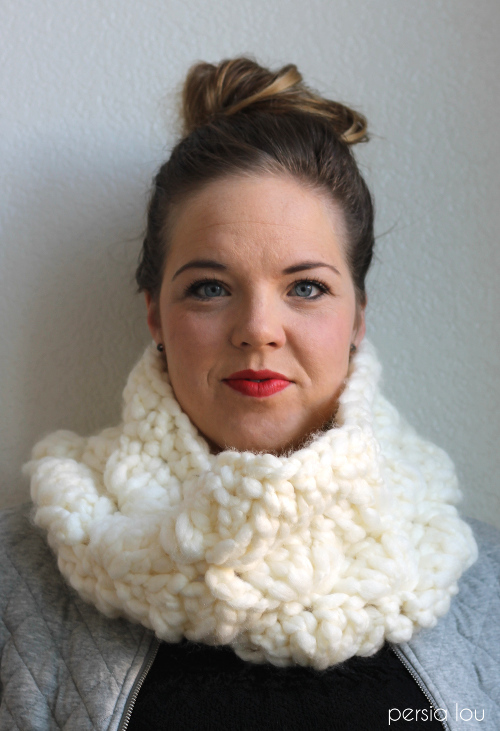 Give your friends the gift of warmth with this super chunky crochet cowl. How caring to make them such a warm and beautiful handmade gift. 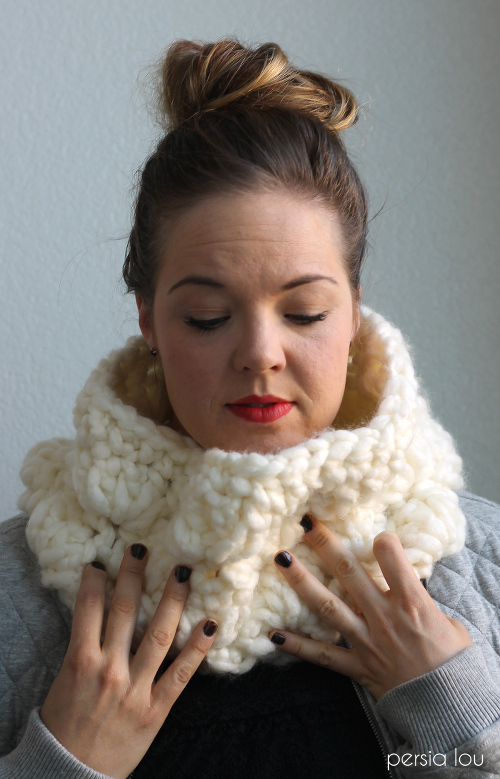 This chunky cowl can be stitched up in about an hour! Handmade gifts are the best and if you get started now you can create a handmade holiday! The whole month of November is filled with handmade gift tutorials. I have teamed up with my friends Thirty Handmade Days (crafty tutorials) and Your Homebased Mom (recipes) to share over 100 super awesome handmade gift ideas! You won’t want to miss a day. I am so excited to make these cute and easy crochet boot cuffs. If you have a child on your list these crayon rolls make a totally useful gift that encourages creativity. We also have fabulous giveaways going on! Head on over to Persia Lou to enter to win a $300 Michael’s Gift Card. Imagine all the yarn you could buy! Chunky crochet cowls for everyone!! Hello Everyone! 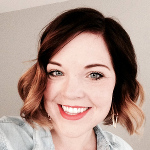 My name is Alexis, and I’m the crafter behind the blog Persia Lou. I am so excited to be here sharing my latest crochet creation with you all! I love making handmade gifts for friends and family for the holidays, but since this time of year is so busy, gifts that don’t take forever to make are ideal. My Super Chunky Crochet Cowl is perfect for last minute crochet gifting because it is works up crazy quick – like in less than an hour. True story! Because it is made with super bulky yarn and a giant hook, it only takes seven rounds to make a cowl that measures about 14″x8″ when laying flat. 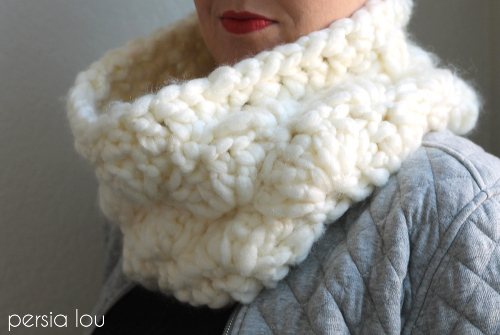 Plus, I think the chunky stitches and pattern give the cowl a fun, modern look. The cowl uses a variation of the double crochet called the long double crochet that gives the shells some extra texture and dimension. 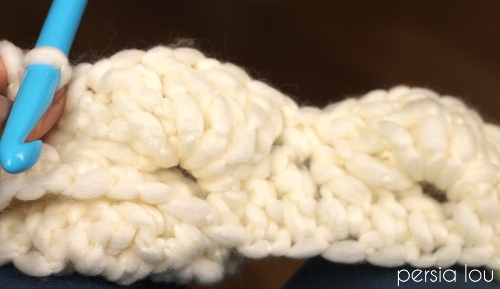 Long Double Crochet (ldc): Yarn over and draw through a loop (3 loops on hook). Pull up on the yarn so the two bottom loops are lengthened until they are brought up to the height of the last loop (see image below). 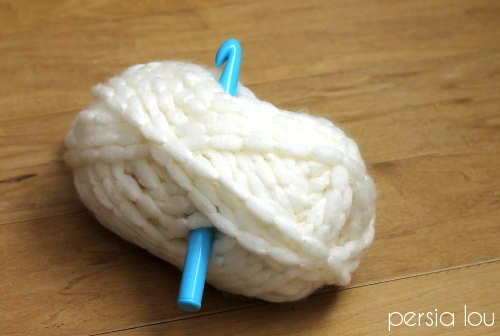 The stitch is finished like a normal dc: yarn over and draw a loop through the two long loops. Two loops remain on hook. 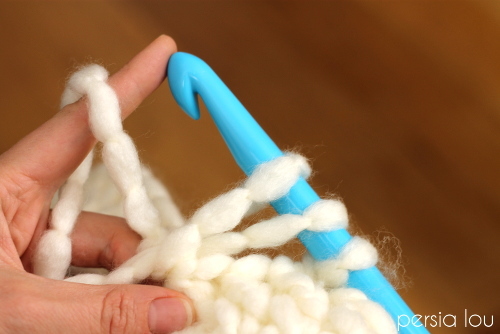 Yarn over and draw through both loops. The long double crochet stitch makes the shells extra poofy, which adds to the chunky look of the cowl. Rnd 2: Ch 2, dc in each ch around, sl st to join. Rnd 3: Ch 1, sc in same st, skip 2 dcs, 5 ldc in next stitch, skip 2 dcs, sc in next stitch, *skip 2 dcs, 5 ldc in next stitch, skip 2 dcs, sc in next stitch, repeat from * around, leaving off last sc, sl st to first sc to join. Rnd 4: Ch 3, 2 ldc in same space, skip 2 ldc, sc in next ldc (center ldc of shell), *skip 2 ldc, 5 ldc in sc, skip 2 ldc, sc in next ldc (center ldc of shell), repeat from * four times, 2 ldc in same space as beginning ch 3, sl st to top ch of beginning ch 3 to join. Rnd 5-6: Repeat rounds 3 and 4. Rnd 7: Ch 1, sc in same space, hdc, dc, dc, dc, hdc, *sc, hdc, dc, dc, dc, hdc, repeat from * around, sl st to first sc to join. Finish off, weave in ends. And that’s it – your new cowl is all ready for gifting! 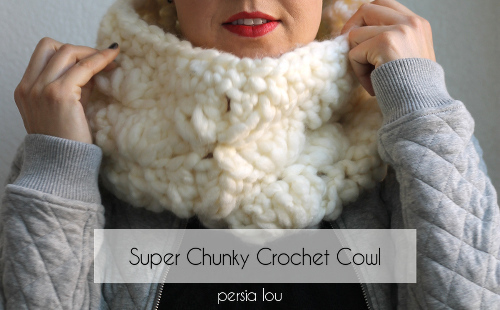 Please check out some of my other crochet patterns at Persia Lou! Alexis Middleton is a lifelong crafter/DIYer and blogger at Persia Lou. As a girl, she spent summers with her grandmother crocheting baby doll afghans, making coasters out of plastic canvas and yarn, and canning apricot jam. Today, Alexis spends a lot of time dreaming up and working on projects for her family’s home. She loves mixing traditional crafting techniques with a more modern aesthetic.